January and February can be difficult months because it's often gray, gloomy and overcast. Not to mention cold! It can really help to cozy up your home and make it warm and inviting. Some people like using dark colors, but after Christmas, I like to neutralize my decor. 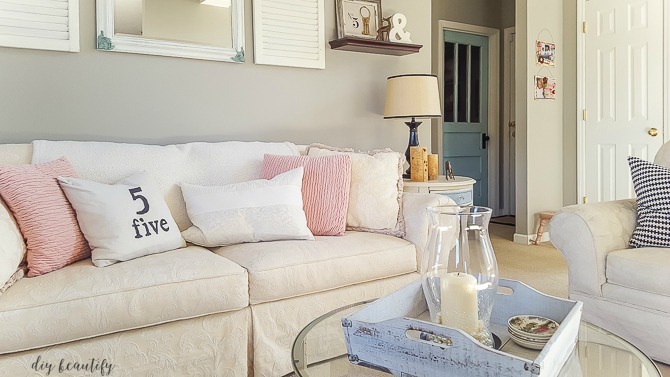 Think winter whites, soft plush blankets, a cozy spot to read by the fire, that kind of thing. I've packed away most of the plaid and left just a couple pieces that are extra cozy. This year, I didn't decorate for Valentines in the traditional way, although I did add some very subtle Valentines decorations that can stay up all winter. Like this sweet little painted cowbell from At Home that I added to my boxwood wreath, along with a gingham ribbon that's been up since Christmas. These painted mason jars from Christmas were simply turned around so you don't see the holly and berries...just the sweet red ball fringe trim. The kitchen is sort of the antithesis of the living room, with dark furniture rather than white. I find it balances the rooms nicely especially with the mutual shade of turquoise popping up around my home. 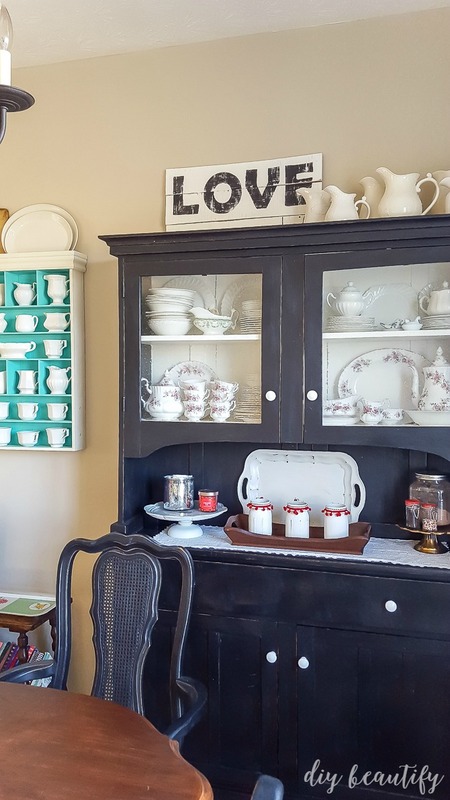 The weathered sign on the top of my hutch was a DIY project that I really enjoyed, and I've shared the tutorial here if you want to make your own. Few changes were made to my winter mantle from the way I had it at Christmas. I simplified it by adding a simple book page garland with doily hearts and buttons. 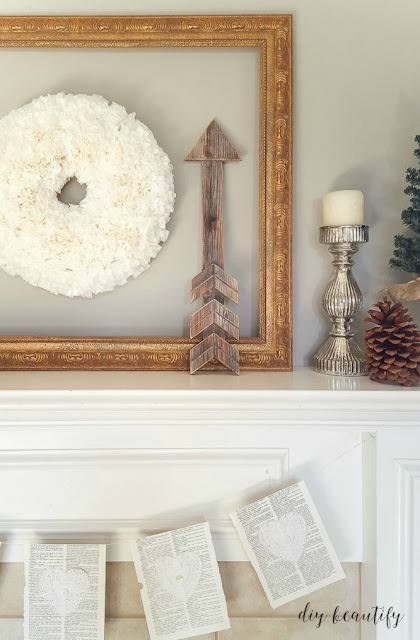 I purchased the rustic looking arrow from Hobby Lobby, which will be an item I can use in every season and every room. 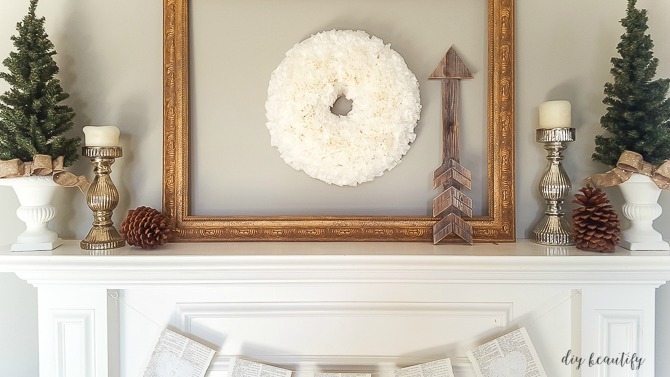 I am loving my winter white coffee filter wreath, and the way it is shown off hanging in the middle of the dumpster frame that I gave new life with Rub 'n Buff. You'll notice I removed the plaid insert that I used at Christmas and it becomes the perfect frame for the gorgeous, all-white wreath! I love a cozy place to read next to the fire when it's chilly outside! I've devoured Miss Mustard Seed's decorating book, Inspired You. It was her tutorials that inspired me and helped me to make the coverings and pillows you see around my home. 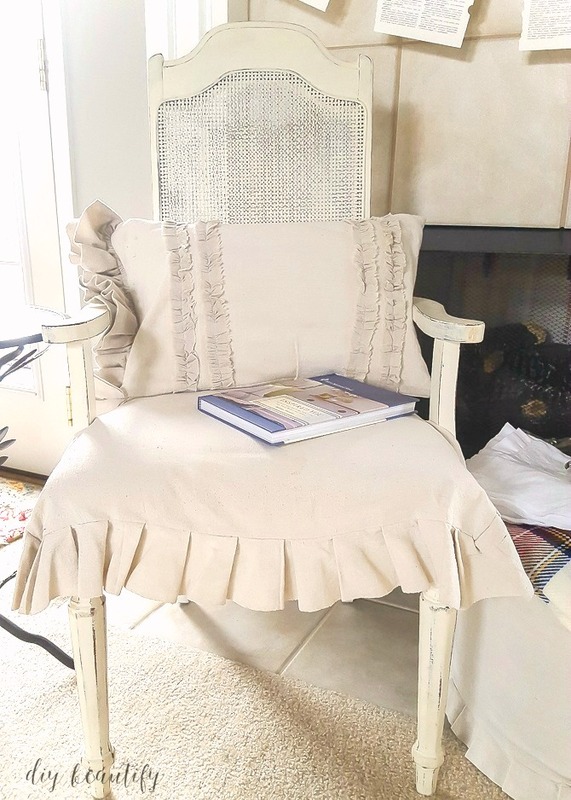 Like this pleated chair skirt, ruffled pillow and ottoman cover. Would you believe they're all made from inexpensive canvas painter's drop cloth?! These gorgeous birch candles, along with the pine cones and simple pine trees on my mantle, bring the feel of nature into my home, and they're a reminder that Spring will be here soon! My living room sofa is my favorite place to stretch out and read a good book. I'm currently reading After You by JoJo Moyes...I love all her books! With the soaring ceilings and lots of windows, the living room is bright and cheerful, even on a cloudy winter day. Cozy pillows up the ante (for me anyway...Mr DIY always throws them on the floor!) and a plush throw is a must! 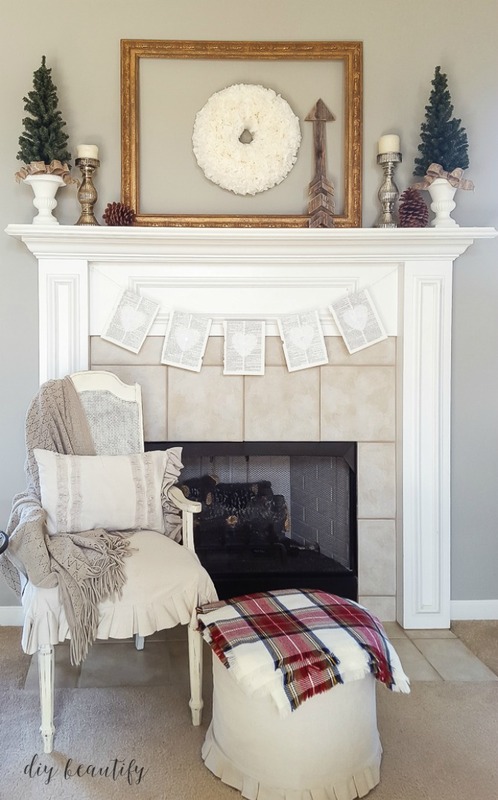 I like keeping my winter decor mostly neutral, with just a touch of soft color that make it feel like a warm hug! See that antique turquoise door? That leads into one of my favorite rooms in my home...my laundry room! Yep, really. Check it out and you'll see why! 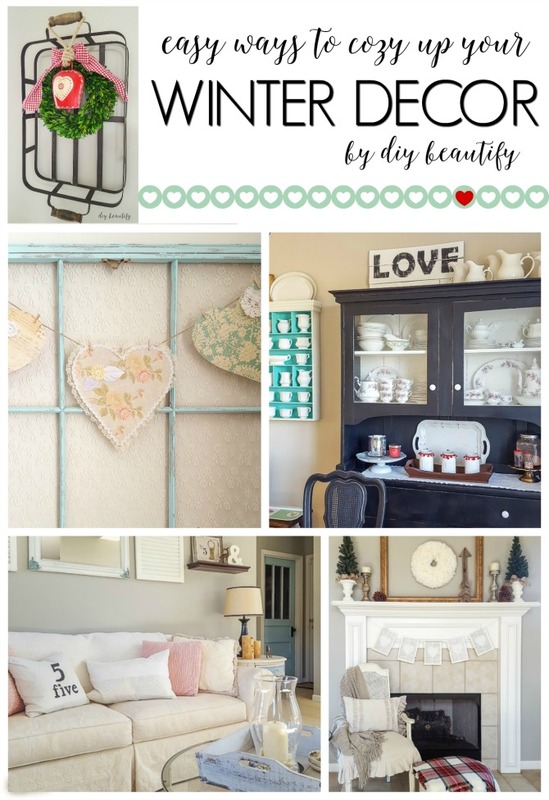 I hope you enjoyed this little tour of my winter decorating and that I've inspired you with the various ways I've cozied up my home to get through these bleak winter months! Hopefully spring is just around the corner! 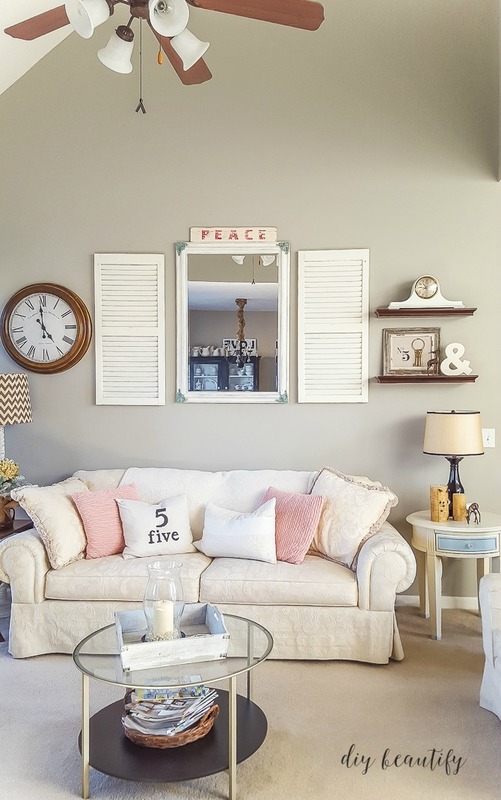 If you're interested in more ideas for decorating with a neutral palette, check out this post.